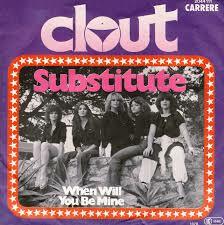 Clout’s ‘Substitute’ became the 14th song to manage at least 7 weeks at 1 as it clung on to the top spot, seeing off the challenge from Wings’ ‘Mull Of Kintyre’ which spent a second week at 2. It sat tied second with Hilary’s ‘Sunglasses’ for weeks at 1 by a local song with only Charisma’s ‘Mammy Blue’ on 12 managing more. Clout was the 30th act to clock up 7 weeks at 1 and sat tied 18th overall with 12 other acts. Neil Diamond celebrated his 100th week in the chart by claiming the biggest climber award with ‘Desirée’ which moved up 6 from 17 to 11. He was the 13th act to reach triple figures for weeks and the 3rd to reach 11 biggest climbers. The Sweet on 13 and Tom Jones on 16 were the 2 acts above him. Santa Esmarelda’s ‘Don’t Let Me Be Misunderstood’ was the only other star rater this week. It moved up 4 from 13 to 9. Falling honours were shared between Sheila B. Devotion’s ‘Singin’ In The Rain’ and Peter Allen’s ‘I Go To Rio’ with both songs dropping 4 places to land at 15 and 13 respectively. Kelly Marie continued to enjoy the status of having the oldest in the charts as her ‘Run To Me’ ticked over to 14 weeks and enjoyed its 2nd week as the longest serving song on the top 20. There was only 1 song leaving the charts this week and that was 5000 Volts’ Can’t Stop Myself From Loving You’ which had enjoyed a run of 5 weeks and a peak of 12, the worst performance of their 4 hits. This would be the end of the road for them on our charts. Their 4 hits had managed a total of 45 weeks with 1 week at 1 by ‘(Walking On A) Love Cloud’ being the best performer. We welcomed Pussycat back to the charts with their 5th hit, ‘If You Ever Come To Amsterdam’. They were the 60th act to reach 5 hits. Coming in at number 19, this was their lowest debut position since their first hit, ‘Mississippi’. However as ‘Mississippi’ went on to top the charts for 8 weeks, this would not have troubled the band. What would have troubled them though was that while ‘Mississippi’ went on to top the charts in at least 13 countries (including the UK), ‘If You Ever Come To Amsterdam’ did not chart anywhere except in their native Holland where it only managed to scrape a peak of 21. It was the 24th song by a Dutch act to chart. This week saw a record to date top 8 positions unmoved from the previous week. We had seen a week where the whole top 20 was frozen due to the Easter weekend, but I have excluded this. Sweden caught up to Ireland for weeks in the charts by acts from those nations. Both countries had seen 149 weeks and they sat tied 8th overall. The main reason for Sweden’s success in this respect was the hit machine called Abba. They were also going places as their 138 weeks put them in clear 2nd place on the weeks count list, going 1 ahead of The Hollies who were on 137. Abba now had Tom Jones in their sights (just) as he was a mere 47 week ahead of them. To date songs had averaged runs of 9.3 weeks in the charts and this meant that Abba needed 4.8 more average chart runs to catch up to Tom.